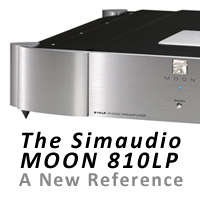 With so much excitement over the $10k – $30k phono preamplifiers, there’s somewhat of a gap between $10k and down. 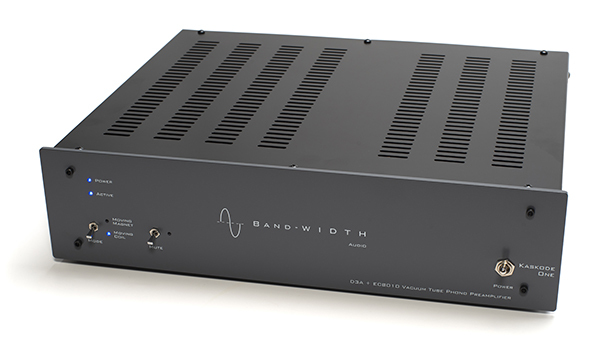 Bandwidth Audio has a great solution. Not everyone has that kind of cash on hand, and with so many audiophiles having either two turntables, or two-armed turntables, the need for a great $6,500 phonostage with more than one input is strong. Though there is a catch – the Kaskode One offers one MM and one MC input (with Lundahl transformers on the MC side), set thusly. This is not a two input phonostage, where either input can be configured for MM or MC. But then again, neither is my $16,000 Conrad-Johnson TEA 1, and I enjoy it every day, so I’m not holding this against the Kaskode, and the Kaskode offers you the option of running the MC input balanced. A nice touch. When used with all of the cartridges at my disposal, nearly all having .4-.5mv output, the 66 dB setting was just fine. I never found the need to go all the way to 72db, except for my Denon 103, which only has .25mv output. Even at maximum gain, the noise level stays low. An all-tube design, the Kaskode piqued my interest immediately, and further investigation reveals a different tube compliment than the typical 12AX7/12AU7/6922 that nearly everyone else uses. Instead, Bandwidth uses hand tested and matched D3a/7721 and EC8010/8556 tubes. The good news is that these tubes are not terribly expensive, the bad news is that you can’t find them. If you love the Kaskode One as much as I do (it’s pretty outstanding) order a few sets of replacement tubes right nowand start the hunt for more. This phonostage uses two of the former and six of the latter. Another benefit to off the beaten path tubes is that you won’t have to agonize about tube rolling. While some enjoy this, I find it more often than not an exercise in futility and a great way to flush a lot of money down the drain. Use the Kaskode with the supplied tubes and enjoy! Diversion from the path traveled by everyone else does have its benefit though. The Kaskode offers an open, natural, dynamic, and quiet sound that you’d expect to have about double the price tag attached to it, maybe more. But then they don’t have 60 mouths to feed and pay health insurance for like Audio Research does. 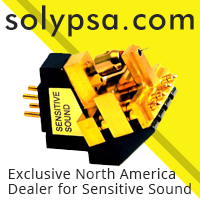 While the Kaskode offers balanced inputs, single-ended RCA outputs are the only option. 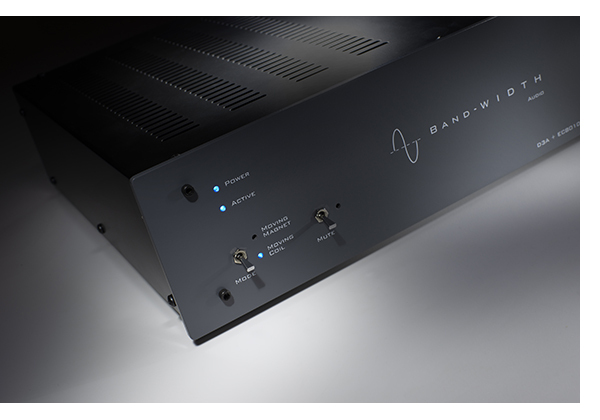 Bandwidth claims that their output stage is very robust and capable of driving long cables with ease. 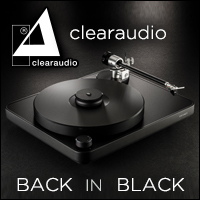 A 30-foot pair of Cardas Clear interconnects, A/B’d with a 3-foot pair confirms this is no problem, so those of you wanting your turntable across the room can rest easy. A number of companies have based their designs on hybrid technology to get the noise floor down, which does work well, but provides a different sonic signature than the Kaskode. 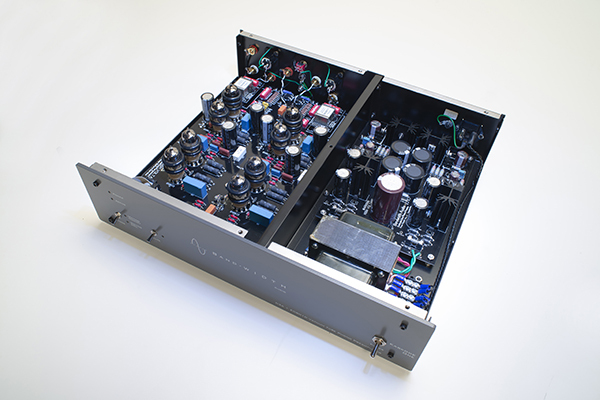 My Audio Research REF Phono 3 is a perfect example of a very mature design – honed over decades. Each tube set/topology has a different sonic signature. It’s up to you to find the one you love and provides the perfect synergy for the rest of your system. This is not a better or worse comparison, but the Kascode does present a different tonality, a different flavor. ARC’s FET/6H30 design is slightly punchier and less “tubey” in it’s presentation. Never a bad thing, but to me it’s like comparing a BMW M6 to a 911 GT3. They both offer tremendous performance, they just go about it differently with a different ride. And the Kaskode does have a different ride. Used in the context of a system with older Magnepans or the Graham LS5/8s (which are already slightly soft tonally) the Kaskode is too much of a good thing for me – though that might be perfect for you if you want that really romantic sound. However, when the Focal Sopra no.3s were in place in system one, or in room two with the Raidho X-1s (both of which are extended and highly revealing) the Kaskode is sheer perfection. Putting this preamplifier through its paces with about ten different cartridges reveals no weak spots. The Kaskode really embodies what I think of when the word analog is brought up. I appreciate the subtle balance at work here. This phonostage has an extended HF range without ever being harsh, combined with a silky smoothness that never feels dark, or rounded off. 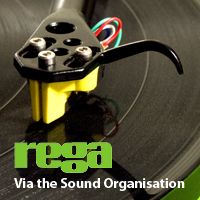 Good as the MC performance is, the Kascode delivers stunning MM performance, so if you are using an MM cart on your second table or second tonearm, you will not be disappointed. Paired with the recent Clearaudio Charisma V2, I never found myself longing for the MC. Thanks to a 1mv output, the Kaskode also works incredibly well with the Grado Statement 2 moving iron cartridge, which requires 47k loading. Regardless of cartridge used, from $95 Shure to $12k Atlas, the Kaskode extracts plenty of music from your LPs. Rather than going on and on about specific musical selections (none of which might even be in your record collection) suffice to say that the Kaskode delivers great all-around performance. If your taste leans more to vocal heavy tracks, you’ll be impressed at how well harmonies are defined, with plenty of three-dimensional “reach out and touch it” going on. The soundstage painted by the Kascode is big in all dimensions. 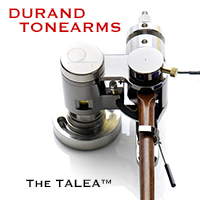 The overall tonal balance is natural yet defined enough to resolve the difference between stringed instruments in an orchestra. Dynamic slam is here in abundance as well, so if you like to rock, the Kaskode has enough sheer dynamic force to keep you interested. Because Bandwidth’s designer Mr. Beardsworth comes from a solid engineering background, the Kaskode offers a lot you don’t see until you remove the cover. The level of detail paid to its construction is first class all the way, from the – 2-layer PC board, all the way to the quality of the solder joints. The Kaskode certainly features $20k build quality. Economic arguments aside, if you’ve been thinking about a two input phonostage, and don’t want to spend five figures, the Kaskode should be at the top of your list. Aesthetics are straight forward and understated. It will fit in nearly anywhere you might use something else, though if you’re super OCD, the grey might be a deal breaker. Personally, I love the semi retro look and the grey instead of the usual black or silver. My only complaint about the Kaskode is very minor. Should you buy one, be super careful around the switches that control mute and MM/MC mode; they are the same flimsy paddle toggles that ARC and BAT used to use years ago. (and I’ve accidentally broken them all) The power switch is much beefier. 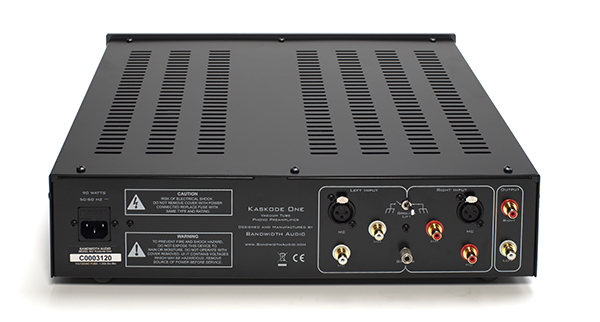 If you don’t change phono cartridges often, hence not needing to change gain and loading on the front panel (or via remote control) Bandwidth Audio’s Kaskode One could very well be your final destination. It turns in impressive sonic performance, and thanks to being produced by a smaller audio company, (with less overhead to build into the price) offers class leading performance at a lower price than you’d pay for a similar offering from the big boys. A true audio value and worthy of one of our Exceptional Value Awards for 2018. And for what it’s worth, one of my personal favorites. Highly recommended. I can’t wait to see what else Bandwidth Audio comes up with in the years to come.